Claire Foy wasn't looking to refute the regal reputation she has earned as Elizabeth II on Netflix's The Crown when transforming into Lisbeth Salander, a.k.a. the girl with the dragon tattoo. "I've been working for 10 years and I played Elizabeth for two of them and I absolutely loved it and I loved playing that character," Foy says in a recent phone interview. "But for me, playing that part was a departure from anything I'd done before just as much as anything else, so I think it would be wrong to make decisions in your career entirely based on what your previous work was." But for audiences -- especially those who got to know her hands clasped, stern gaze, talking down to her wayward husband -- Lisbeth is a completely new look and vibe. She maintains an eternal detached unknowability, but her Scandinavian punk aesthetic could not be further from the halls of Windsor Castle. After all, Elizabeth II wouldn't be caught in a t-shirt that reads "Gimme head until I'm dead." 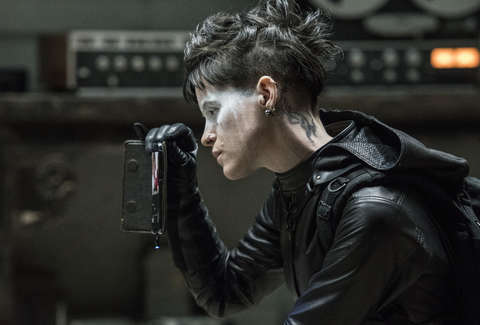 Foy is very much the reason to see this latest take on Stieg Larsson's character, The Girl in the Spider's Web, directed by Fede Alvarez of 2016's breakout horror film Don't Breathe. If you checked out after the original trilogy -- which ended with The Girl who Kicked the Hornet's Nest -- you might be confused. But Spider's Web is not actually based on one of the Salander novels written by Larsson, who died in 2004. Instead, the source material is an authorized spinoff by David Lagercrantz. Despite the fact there's been no American-produced follow-up to David Fincher's 2011 The Girl with the Dragon Tattoo starring Rooney Mara, Alvarez's take offers no summary of the events that occurred in between these two movies. As it begins, Lisbeth is doing hacking for hire and spending her free time as a vigilante, targeting vicious men viciously. She's distanced herself from her partner/lover Mikael Blomkvist (Sverrir Gudnason), who is looking for his next big story at his magazine, Millennium. They are thrust together once again after Lisbeth is recruiter to (virtually) steal a computer gadget that, somewhat unfathomably, can launch any nuclear arsenal in the world. Once she completes her task, the doodad is stolen by a violent group whose calling card is a spider tattoo. If this sounds more like a James Bond movie plot than a twisty mystery, you'd be right. The Girl in the Spider's Web eschews brutal mystery for motorcycle chases and heists. Lisbeth, despite her antisocial tendencies, ends up working with a motley team that may as well have Ving Rhames on it. (Yes, think a Mission: Impossible movie without Tom Cruise risking his life.) "I think that Fede really wanted to put Lisbeth at the center of the drama," Foy says. "He really wanted to make her the protagonist and have her driving the action and I think he wanted to test her. He wanted to put her in situations you hadn't really seen before, and, ultimately, he wanted to make a really thrilling and fast-paced movie." The Girl franchise has long held an uneasy relationship between the way it balances its exploration of trauma -- Lisbeth is an assault survivor -- and its potboiler elements. (In reviewing Fincher's version, the New York Times' A.O. Scott wrote that it handles sexual violence "with queasy, teasing sensationalism.") Here, those two poles are highlighted in the movie's twist, which finds Lisbeth reunited with her sister Camilla (Sylvia Hoeks). In a prologue, we see Lisbeth escape from their abusive father, leaving Camilla behind. Later, it's revealed that Camilla took over their dad's criminal organization, the cruelty she suffered turning her into a villain with a penchant for sleek red suits and a ghostly pallor, hellbent on world destruction. "Just by knowing that she's her sibling, you know they have established the same upbringing, the same challenges that come with having the parents that they did," Foy adds. "And the same tragedy that results in that." There's an uncomfortable sadness lingering under Camilla's ludicrous machinations. But these are beats that Alvarez largely overlooks in favor of more world's gonna blow up hijinks. There's a reason Lisbeth makes such a good Claire Foy character. Since Foy became a star, she's excelled at playing women who are forced to wear masks -- either out of their own volition or because of their place in society. Even as Elizabeth remains utterly poised in The Crown, you can read fear or frustration behind that demeanor. In First Man, Janet Armstrong emotes more than her withholding husband Neil, but she still must play the supportive wife, even when his silence causes a rift between them. (When she lets loose, calling the NASA astronauts a "bunch of boys," it's thrilling.) She began the year with Steven Soderbergh's Unsane playing a woman trying to keep up appearances while being gaslit by a stalker. And then, of course, there is Lisbeth, who wears her hardened gaze like armor, in on her own jokes. "Stoic" is a word that gets thrown out a lot when talking about Foy and her creations. Asked what interests her in portraying that reserved calm, she responds: "I think that it's survival really, I find. I think it's their struggle to exist, I suppose, in whatever way there is. I think that's a very truthful thing. I think everybody is struggling to find their way anyway. That's what makes drama, is when you see people going against their better judgement to find their way through a difficult situation."